Books On War: What is Australia's Oldest WW1 Memorial? They have been with us all our lives. Like a sentinel of our community, those stone faced men, arms reversed, which have forever stood on top of a variety of obelisks. The dead of our early conflicts never did come home to Australia. So the people wanted somewhere to mourn the loss of love ones. 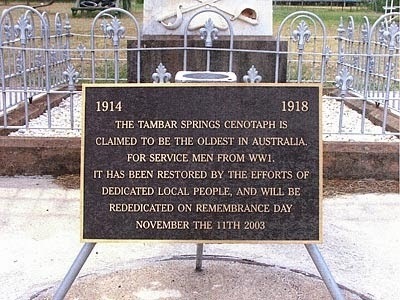 Due to Australia’s higher involvement in WW1, during the 1920’s most towns made one. Lists of names adorn most of the memorials. They were made as a physical symbol to the emotional response to the war. Our war monuments have a major historical significant no matter where they are located from our largest city to the smallest town. What is Oldest Australia's Oldest WW1 Memorial? 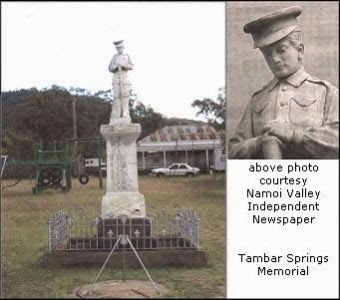 Interesting, the oldest WW1 Memorial in Australia was made in the small Australian village of Tambar Springs NSW. Notice the youthful appearance of the soldier. The principal benefactor of the memorial lost his son who was only 17 years old – thus it is believed to be in his likeness.